The first weekend of HALI at Olympia International Art & Antiques Fair was off to a good start. 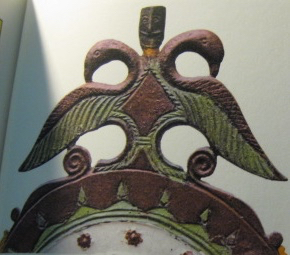 Robert Chenciner (author of a memorable article in Cornucopia 28, ‘The Peoples that Time Forgot’), gave a characteristically vivid account yesterday afternoon of eagle motifs in North Caucasian – and particularly Dagestani – textiles, embroideries, mosaics and carved wood and stone objects. He was armed with a dum flat-woven run, a black ‘bourka’ felt cloak, a Kaitag embroidery, a wooden spoon box, a felt mosaic, and two West Ukrainian rushnik (long brocaded forearm-width bands, used to bind arms in marriage, draped on family and religious images and in burial), and treated his enthralled audience to a recording of singing accompanied by a pandur. He was even able to produce one of the only two pandur to exist outside Russia. Chenciner examines not just the objects and textiles themselves, but the folklore of dragons and eagle motifs in the region. His interest in these birds of prey was sparked when he once saw no fewer than 50 eagles circling on the thermals in Dagestan. Locals told him that the grown eagles were teaching the youngsters to fly. 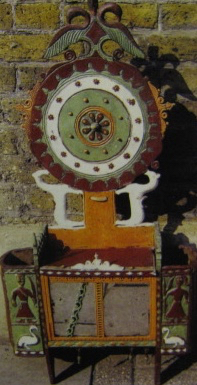 The 18th-century Kaitag embroidery (silk on cotton), above, depicts a cosmic journey map with a small eagle motif inside the white ring on the left. ‘Eagles mean something good in the Caucasus. They are used as talismans, to ward off evil,’ Chenciner says. Chenciner's mid-19th-century wooden spoon box is capped with a double-headed eagle, from which emerges a karakul-hatted, moustachioed Dagestani warrior. It is richly carved and painted talismanic container associated with the hearth, strength of the family and ancestor worship. ‘The eagle symbolises how strong the Caucasians were when fighting the Russians in the 1800s,’ says Chenciner, who is also author of Tattooed Mountain Women and Spoon Boxes of Daghestan. Russia annexed the Caucasus in 1801, and the final surrender of the Kabardins was in 1864, after the main resistance of the mountaineer Dagestanis and Chechens ended in 1859. 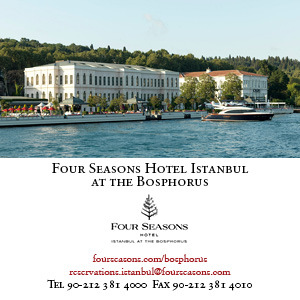 The spoons in the box were used to eat mutton broth and khinkal dumplings served to guests. This pieces is a West Ukrainian rushnik flat brocade rug from the late 19th century. Note the row of chickens above four rows of Austro-Hungarian Hapsburg double-headed eagles (in two different designs). 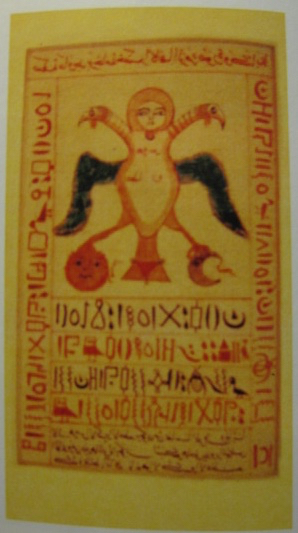 This is an 18th-century edition of 13th-century alchemical work Seven Clines which improbably features both Arabic script and hieroglyphics, and a double-headed Pharonic eagle talisman. For more, you can purchase Robert’s hard-to-find book Dragons, Padlocks and Tamerlane’s Balls: A Material-Cultural Memoir of Textiles, Art, Metals and Myth from the Cornucopia store. We have several copies (one signed) available at the Cornucopia stand, number 50, on Gallery Level. Get it while it’s hot. Meanwhile, our neighbour Brian MacDonald Antique Carpets (stand 48) is selling an antique Turkmen Wedding Rug, in mint condition, which has its very own eagle motif down the bottom. This rare example of a fabulous work from the Yomut tribes is priced at £3,500. 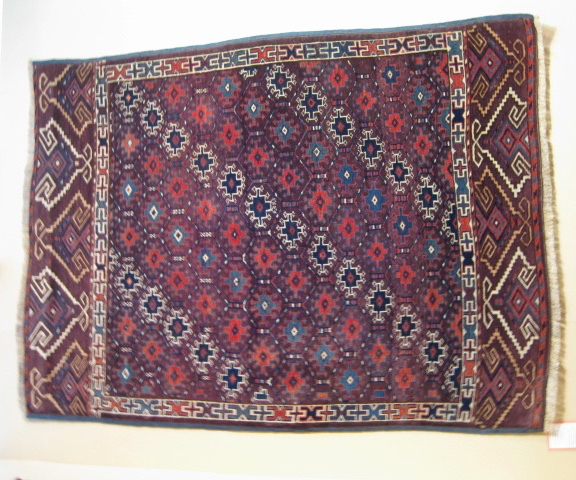 Main image shows a rug from the Robert Chenciner Collection.